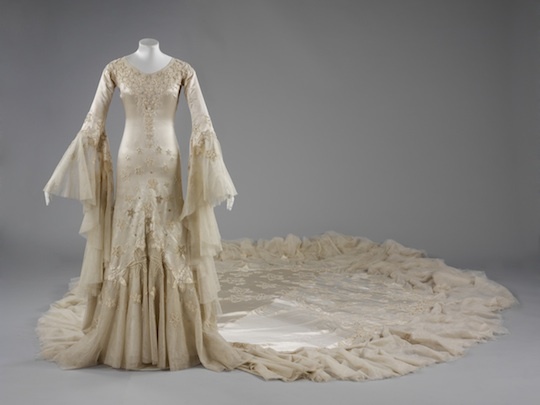 So rumor got out about this fantastical dress, and on her wedding day, Miss Margaret found traffic jams in the streets of London, with people anxious to see the dress. And for good reason. It's easy to see how Mr. Hartnell became such a favorite of the royals, isn't it? If you'd like to see a bit of footage of the recessional from the wedding, here it is. What a bunch of somber bridesmaids. Sadly, the wedding ended in divorce in 1947. Mrs. Surrey later fell down an elevator shaft, falling 40 feet. The resulting head injury caused her to lose her sense of taste and smell, and to become something of a nymphomaniac. Her next marriage in 1951, to the Duke of Argyll, ended in a very nasty divorce full of Polaroids of her escapades. But despite her marital foibles, on one wonderful day in 1933, she was princess for a day, and wore the most beautiful silk creation to grace the planet thus far. 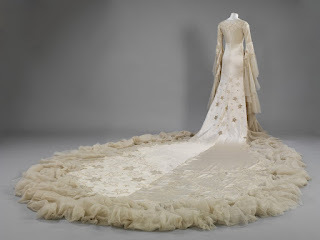 If you'd like to see other beautiful wedding dress creations, check out this link. How I would've loved to be there for the unveiling of that display. I saw a photo of this dress recently with no details about it. Thank you for the post. It is a magical dress. Do you know what fabrics the brilliant Mr. Hartnell used?